Only one person has been prosecuted for their criminal culpability in the blacklisting scandal, with not a single construction director behind the illegal operation having faced charges. However, Ian Kerr, the former head of the Consulting Association – the industry financed organisation that spied on union and safety activists and provided the information to major site firms – has now been joined by award-winning human rights campaigner Dave Smith, as the focus of a prosecution. Smith, a blacklisted worker and secretary of the Blacklist Support Group, was found guilty this week but discharged at the City of London magistrates’ court for disrupting traffic in Park Lane, London, in a blacklisting protest in March last year. Commenting after his conviction, he said since the scandal erupted, “only two people have ever been convicted because of their involvement with blacklisting — Ian Kerr and me.” Smith was not fined but the offence will be held on his record for the next six months. Green Party member of the House of Lords Jenny Jones added that companies caught using blacklisting should not be left with the responsibility for ridding the industry of the practice. 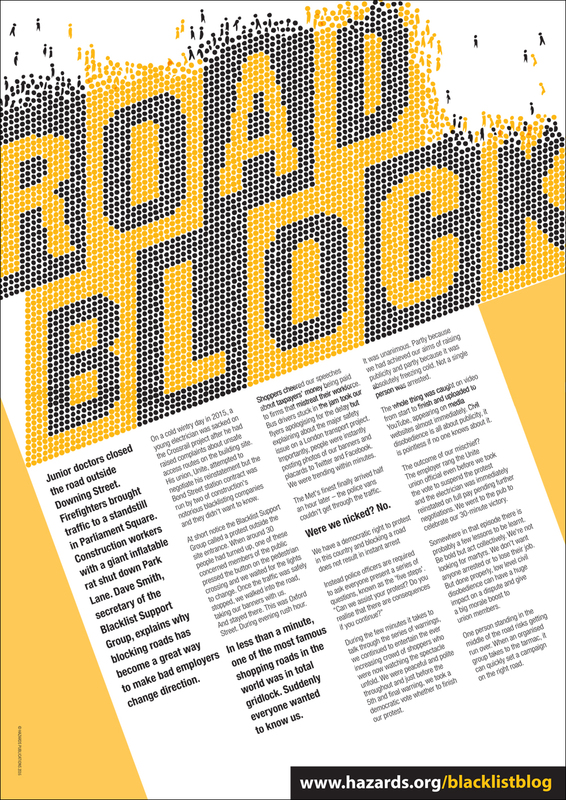 Road block: How blocking roads has become a great way of making employers change direction, Hazards, 2016.